This is the way of Mt Amadablam Expedition. Its height is of 6812m. It lies in Nepal. The time/duration for this Expedition is about 25-30 Days. 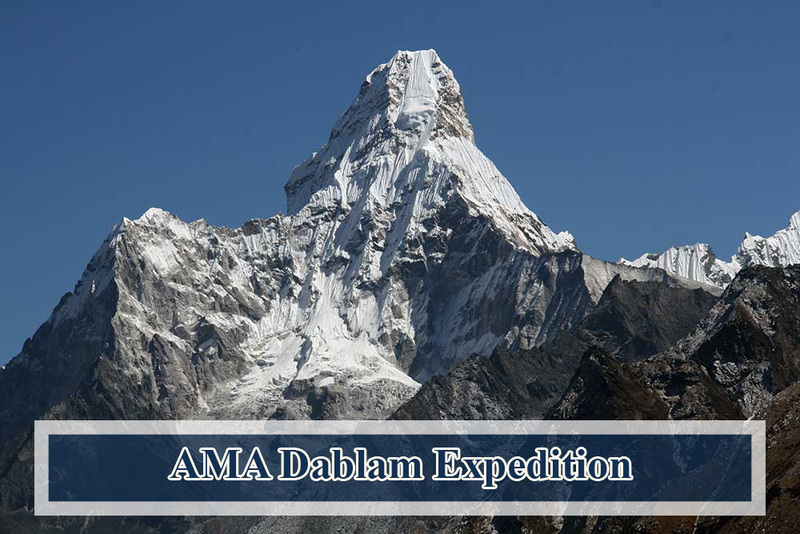 If any of you out there are interested in making your Dream to the top of Mt Amadablam, then you are all welcome. We Give you the best price and provide you the best services as per your requirement for the Expedition. In some circumstances, we could face the problem of internal flights to/from Lukla delayed by few hours or canceled for a day or more because of bad weather. Very rarely, but it could happen even in best trekking season also as you know how climate change is affecting our globe. Thus, we always recommend you to add supplement night/s in Kathmandu after your trek if possible (just for in case). If everything runs smoothly, you can enjoy other activities like sightseeing, rafting, wildlife activities, shopping, as you wish in that additional day.However, if you want Helicopter rescue in the state of flight cancellation to/from Lukla-we can organize it. A helicopter charges around USD 5000 and it can lift 4 persons per flight.